This may seem like a no-brainer, but I cannot emphasize how important this concept is in the kitchen. It is critical to quick preps and fast cooking, especially if you are starting to prepare more plant-based meals! So take a minute to stop and consider: when was the last time you had your knives sharpened by someone or when did you do it yourself? If you can’t remember the last time, or if it was about a year ago or more, then it’s time to sharpen them again. Why sharpen? We all know that something which is sharp cuts quicker and more readily through the material being cut. The same applies to our kitchen knives. If you are stretched for time (especially if you are a working parent and return home after a full-time job to a hungry family waiting for dinner), then you will want a kitchen tool that is fast and effective in getting the job done. In my mind, a blunt knife is actually more dangerous, because it can cause you to use more effort in chopping, with an increased likelihood of the knife slipping off a hard fruit or vegetable when cutting to cause injury. Does it take a lot of time? No! It takes at most 2 minutes to do, if you have a knife sharpening tool. How do I tell if my knife needs sharpening? I think the Bible hit it spot on with the following part of a verse, “If the iron is blunt, and one does not sharpen the edge, he must use more strength…(Ecclesiastes 10:10a).” So basically, if you feel you are needing to exert more effort to cut through hard vegetables and fruits, then it is probably time to sharpen the knife you use most regularly. So…how do you sharpen a knife? There are of course many different models and types of knife sharpeners on the market, with markedly different prices. You certainly do not need to spend a lot of money splurging on a knife sharpener. Case in point: about 15 years ago, I had bought a two stage knife sharpener (with a scissors sharpener function too!) for about $15 USD at a Williams Sonoma store. I have had it ever since and it has been a handy kitchen tool. See the image above which shows the instructions on the back of the brand Wüsthof Knife-Life Sharpener tool I have. It basically involves two super easy steps. All you need is a flat surface at a comfortable height (e.g., on the countertop), the knife to be sharpened and the sharpening tool. I run the knife blade from the heel to the tip in the ‘coarse’ slot about 10-15 times, then I run the knife blade from the heel to the tip in the ‘Fine’ slot about 10 – 15 times. In both cases, I apply a bit of downward pressure. Then I wash the blade before using. That’s it! I am not endorsing use of this particular brand of knife sharpener of course, just explaining how I use the tool that I possess. 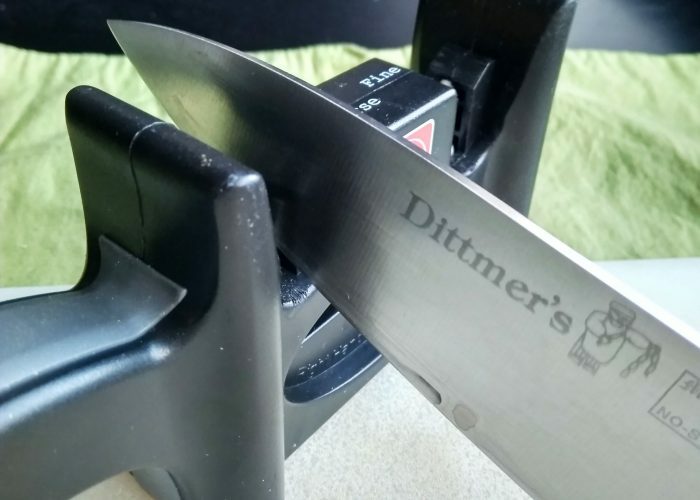 If you would like to know more about other options of knife sharpeners on the market, I came across this helpful article which may provide more insight to you. How often should I repeat knife sharpening? This really depends on how much whole-food, plant-based cooking you do, and how frequently you are cutting up hard vegetables and fruits. Before our family went plant-based, I was perhaps only sharpening my commonly used knives about once or twice a year. However, now that I am pretty much cutting up fruits and vegetables all the time, I find I need to sharpen my knives about once a month or every two months. So take a little bit of time to make sure your knives are sharpened periodically during the year. This will save you a ton of time and effort when cooking, and make cooking plant-based foods that much easier and more enjoyable. It will also give you less strain on your arms and hands! Great tips, thanks a lot for sharing ! Wow!great blog.I am house wife.I always using knife for cut vegetables.This blog helps to me very much.Thanks for your advice. Thank you for your comment. I am glad you found this article helpful!